MashButtons: There is no time - Arkham Asylum awaits! Since earlier this year, we've written countless posts (11) consisting of countless words (1700+) hyping the game that no one saw coming (are we kidding?). Batman appears as if it's going to be a hit (review forthcoming); so a sleeper it is not, however it's a bit surprising that a licensed game by a relatively unknown developer is getting as much attention as it is. Good for them - the game IS awesome - be sure to come back soon for a full review. 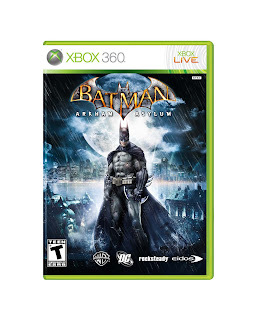 So without any further words, Batman: Arkham Asylum is available today at your favorite retailer for the Xbox 360 and Playstation 3. One of the best game I've ever seen so far from an unknown publisher. I love the moves and combos of the game, I'm feeling the excitement of playing this game and if I can remember the last game that made me feel this way was in Warcraft playing my horde toon. So far it's a great game, and getting great reviews across the industry. We should have a review up shortly, but as you know, there's alot of game here.